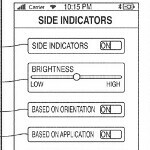 Apple filed an application with the Patent and Trademark office in 2009 entitled "Electronic Devices with a Primary Display and a Selectively Illuminated Secondary Display. "The concept, just being released by the U.S. Patent and Trademark Office, has to do with the limited real estate on the screen of a cell phone. While currently, buttons on the display show Apple iPhone and iPad users where to press on the screen, freeing up that space would allow for more content to be displayed on the phone's touchscreen. To free up some more screen space, indicators and touch-sensitive buttons would be moved to the bezel that surrounds the screen of a handset, and help the user of the device navigate the unit by pointing out where to press the screen, or to act as the input button itself. 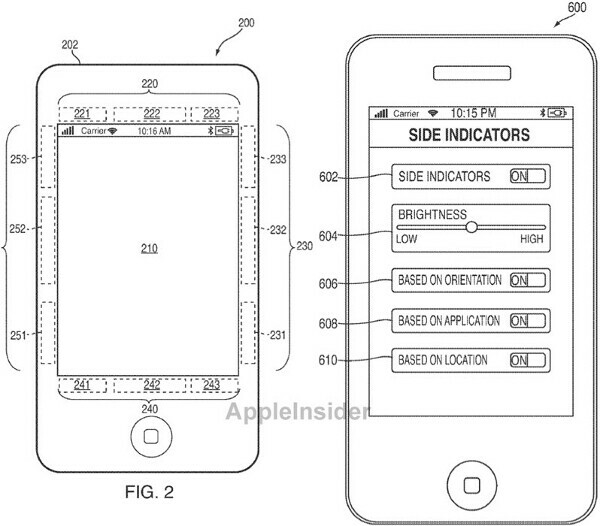 The secondary display, which Apple called a "printed segmented electroluminescence display" in the filing, would illuminate some of the area of the bezel, or display icons or graphics which would be appropriate for an active application. The secondary display would also take into consideration the orientation of the device, whether it is being held in portrait or landscape mode. One major advantage of using the bezel to house the secondary display is that it would keep the users fingers from getting in the way of running the app. That could be very useful if the device was being used to play a video game. Um...ok then. Whatever floats Apple's boat. What does this do to form factor? The other rumors of a 4" main screen and these bezel buttons imply the phone will get wider and taller. And of course, even if Apple would be the first to implement this tech into their iphone, fandroids would say "this has been around in ages", even when not a single android phone has it yet :) And then the following year, there would be an android device that would add this feature, but maybe add a couple more functions into it than the existing ones on the iphone, and then they would say "Apple is playing catch up", hahahahaha. The secondary display, which Apple called a "printed segmented electroluminescence display" in the filing, would illuminate some of the area of the bezel, or display icons or graphics which would be appropriate for an active application. The secondary display would also take into consideration the orientation of the device, whether it is being held in portrait or landscape mode. Isn't this the same as having touch capacitive buttons? Is Apple finally admitting that the one magic button isn't enough and requires more? Apple is still playing catch up. Isn't this similar to what the HTC Incredible S/2 can do with the rotating capacitive buttons? well there are people working son similar ideas already, tough it was Samsung, my bad here is the sourcehttp://www.phonearena.com/news/Concept-Line-Phone-gives-you-buttonless-control-over-the-screen_id161 50 also Samsung has the Samsung continuum witch works notifications on a small bat at the bottom http://www.phonearena.com/phones/Samsung-Continuum_id4823 I also don't think I've said the iPhone is copying others did I? similarities on two projects and copy are two different things. or is it bad for me to give an Idea on something that might look like it since there is not a physical yet? Its already been done, but it'll be the best new idea ever when apple "invents" it lol. What a joke.